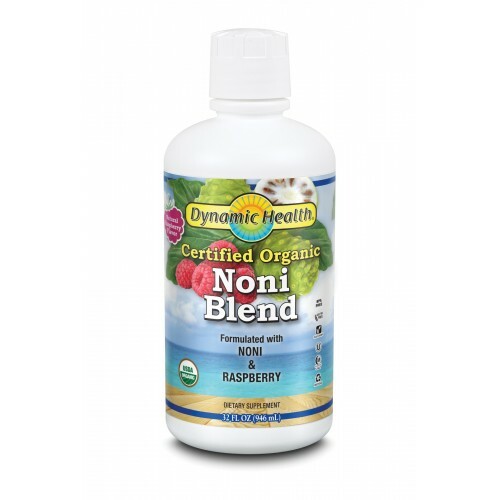 Tahitian Noni Juice containing 90% pure Organic Certified Noni Juice from Tahiti with 3% Organic Raspberry Puree, 6.6% Organic Apple Concentrate and 0.2% Natural Raspberry Flavour. Also now available 100% Organic Noni Juice, Noni for Women and Noni for Men. We need to draw your attention to the fact that some unscrupulous companies are stating that Noni Juice has to be sold in glass bottles, otherwise it is inferior. Please be advised that this is not true. The glass bottle story is being used as a marketing ploy in order to make you pay more for Noni Juice, sometimes up to £35 per bottle. Before you buy a juice make sure it is not from a Network Marketing Company and make sure that it is not watered down. If you see a ridiculously priced Noni Juice that seems too good to be true, then it probably is just that! Pure Noni Juice has the consistency of thick syrup. The Organic Noni Juice from Perfect Shape is 90% Pure Noni with 3% Organic Raspberry Puree, 6.6% Organic Apple Concentrate and 0.2% Natural Raspberry Flavour. Otherwise known as Morinda Citrifolia, Noni is a remarkable life sustaining plant that grows in various parts of the world including French Polynesia (the best known of these Islands being Tahiti), Hawaii and South East Asia. The Noni in Perfect Shape's Noni Juice originates from Tahiti, where the tropical climate and mineral rich volcanic soil provide ideal growing conditions for this precious fruit. Noni is an evergreen shrub or bush that can grow to a height of between fifteen to twenty feet. Noni fruit looks like a green grenade which is covered with reddish brown seed pits that give it a lumpy texture. The fruit starts green, turns yellow, ripens to whiteness & then falls from the tree. The tree bears fruits all year round. Once one fruit is picked, a new one will take its place after only three months! The Noni fruit, in its raw form, smells foul & tastes just as bad! Many people find that Pure Noni Juice without any flavouring added is totally unpalatable. Considering Perfect Shape's Noni Juice has such a small amount of natural organic raspberry flavour added, it tastes amazingly good. The earliest reference to Noni being used as a medicine date back several thousand years to India's Sanskrit writings when it was used in Ayurvedic medicine. Noni is still used in the native medicinal systems of the islands of the South & Central Pacific (Tahiti, Samoa, Tonga & Hawaii) and also in Southeast Asia (Malaysia & the Philippines). Different parts of the Noni plant that are used include the bark, leaves, flowers, fruit & seeds. Noni was, and still is, prescribed by the native Polynesian healers to treat a range of medical conditions including pain, inflammation, burns, skin problems, intestinal worms, nausea, food poisoning, fevers, bowel problems, menstrual problems, insect and animal bites. World renowned Noni expert, Dr. Neil Solomon, describes Noni as a non-addictive natural product that is safe to take with medications and other food supplements. Noni benefits so many people as it contains so many naturally occurring minerals, enzymes, anti-oxidants, vitamins, phytonutrients and bioflavonoids. In fact, over 150 nutraceuticals have been found in the Noni fruit. Some of those identified include anthraquinones, beta-carotene, calcium, linoleic acid, magnesium, pectin, potassium, proline, protein, proxeronine, proxeroninease, scopoletin, beta-sitosterols, sterols, phenylalanine & tyrosine, ursolic acid, all the B vitamins & antioxidants like vitamin C, proanthocyanadins & anthocyanadins. Our bodies work by biochemical reactions. Examples include growing hair, digesting food, healing injuries, fighting infections, walking, thinking and feeling. There are certain processes in our body that are primary & supportive of the entire body. Any change in these primary processes can cause dramatic changes throughout our whole body & other aspects of our life. Two of the main primary processes include the processes of synthesis and of communication. Synthesis includes all the things that our bodies make - for example - proteins, connective tissues, new cells, hormones and DNA. Communication refers to the flow of chemically controlled information among the cells, for proper co-ordinated growth of the human body as a whole. Globular proteins are the workhorses for both synthesis (enzymes) & communication (cell wall receptors) processes. Globular proteins are long strands of amino acids connected like beads on a string. Big & wobbly, they spend only a very short time in the precise shape that does most of their intended work. More about proteins... Enzymes catalyse every biochemical reaction in the body & the cell wall receptors are responsible for much of the communication that occurs biochemically in the body. To increase the effectiveness of an enzyme or receptor, our bodies produce a small molecule called xeronine that wedges itself between the strands of protein, making it more rigid & hence spending more time in its biochemically efficient configuration. Dr. Ralph Heinicke, a research biochemist, pioneered the study of the alkaloid Xeronine. Xeronine is produced in the body (large intestine) from the building blocks Proxeronine, Proxeroninase and Seratonin. Our bodies contain all of these blocks, but proxeronine may be in short supply. Under usual circumstances, the liver stores proxeronine, releasing it into the bloodstream every two hours. Additional quantity of proxeronine required comes from the food that we eat. However soil depletion and environmental degradation have reduced the amount of xeronine building blocks in our food. Also illnesses, aging, stresses and highly active lifestyles have placed an increased demand on the proteins in our body. To increase the supply of xeronine in our body, more proxeronine will need to be supplied through our diet. Noni is found to contain, in abundant quantity, the building blocks for xeronine, namely proxeronine and the enzymes needed to convert proxeronine into xeronine, known as proxeronase. The Noni plant has brought hope and helpful benefits to people for the past 2,000 years. It is not completely understood how Noni juice works in the human body, but several scientific studies, as well as anecdotal evidence from Noni testimonials, say it works. In the past 50 years, scientists and researchers around the world have begun to better understand how the compounds found in Noni fruit work. The majority of the published research has come from researchers at the University of Hawaii School of Medicine, as well as other laboratories in France and Japan. World reknowned Noni expert, Dr. Neil Solomon, collected data from over 200 health professionals representing 20,000 people who drank Noni juice. "A former professional CELTIC player has been cured of crippling injury by taking "jungle juice." Chris Morris has hailed the health drink - Tahitian noni juice - for his amazing recovery. The 41-year-old had to retire prematurely eight years ago after a string of operations on his knees. If he hadn't, he would have caused irreparable damage. But now he is turning out every week for his local team in Newquay, Cornwall. " "I have just placed my 2nd order for your NONI juice, I am half-way through my 1st litre and it has made such a difference already to my health. I suffer with High Blood Pressure, Arthritis, Hiatus Hernia and Irritable Bowel Syndrome since the removal of my gallbladder." Suggested usage: Take up to 2 tablespoons (1 fl oz) before breakfast and 2 before dinner for the first month. Months 2 - 6 take 2 tablespoons before breakfast and 1 before dinner..Thereafter take a maintenance dose of 1 tablespoon twice per day. Halve the dosage if under 16 years of age. Always shake the bottle before use and store in refrigerator once opened Serving size 2 Tablespoons (30ml) servings per container Approx 32 Buy Noni Juice and take advantage of our special offers TODAY! Take up to 2 tablespoons (1 fl oz) before breakfast and 2 before dinner for the first month. Months 2 - 6 take 2 tablespoons before breakfast and 1 before dinner..Thereafter take a maintenance dose of 1 tablespoon twice per day. Halve the dosage if under 16 years of age. Since starting daily noni-juice I have found it to be an invaluable defence against colds and flus. I ran out of it last winter and ended up with swine flu which lasted for months. Have taken Noni Juice for several years and since taking it i`ve hardly had any colds. I think its a good all rounder. The raspberry flavour makes it so easy to take.